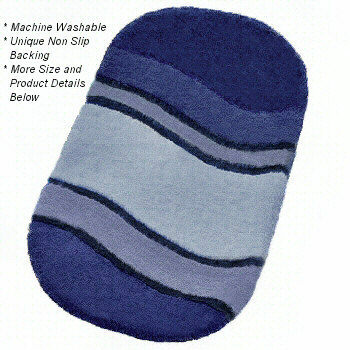 Sculpted oval bath rug design with a premium non slip long wearing backing. The ends on this oval design are squared off adding to its unique look. Anthracite Grey: Soft grey tones from a deeper anthracite grey to medium true grey tones and a very light grey in the center of the design. Coordinated Lid Cover: Solid Anthracite Grey : darkest color in swatch. Sorrento Azure Blue: A classic range of blue from the bright deep sorrento azure blue to medium tone blues and a soft blue in the center of the design. Coordinated Lid Cover: Solid Sorrento Azure Blue : darkest color in swatch. Moss Green: A unique range of yellow green tones from a deep earthy moss green to medium tone yellow greens and a light yellow green tone in the center of the design. Coordinated Lid Cover: Solid Moss Green : darkest color in swatch. Saffron: Bright beautiful oval bath rug with a range of orange tones from a deep orange to medium tone orange and a soft yellow orange tone in the center of the design. Coordinated Lid Cover: Solid Saffron: darkest color in swatch. Bamboo Beige: A range of rich brown tones from a deep brown tone to medium tone brown and a light soft brown in the center of the design. Coordinated Lid Cover: Solid Bamboo Beige : darkest color in swatch. Elongated lid covers for the Siesta design are solid colors and are coordinated with the darkest tone in the swatches.